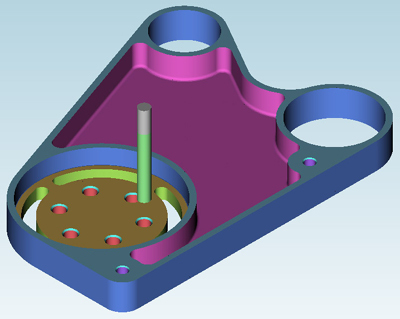 Advanced Polygon Model based integrated toolpath verification, included as standard at no extra cost, boasting features typically only found on high end systems. Colour Material Stock by tool or operation. Stop when collision detected during rapid move or with none cutting area of tool. Stop after each move or each Tool or each Operation. Support for multiple tool shapes: Face Mill, Ball Nose, Bull Nose, Taper, Reamer, Bore, Countersink and Spot Drill. VCR Operation: Abort, Forwards, Pause, Fast Forwards and Reset. Save Material Stock as STL Model. Zoom, Pan and Rotate view while Simulating. Integrated simulation. Runs in main window. Tool Rendering: Solid, Translucent, Wireframe and Hide. Toolpath Rendering: Hide, Show, Trace and Follow. Model Rendering: Show and Hide. Auto Cube - Creates a cube that bounds all toolpaths. From STL Model - Converts an STL model to Material Stock. Extrude Contours - Converts selected Contours to Material Stock, with holes. No limit to number of Material Stock's created.